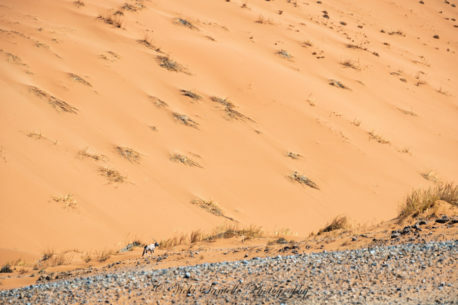 A lone Oryx picks his way through a rocky gully at the base of a dune in Sossusvlei, Namibia. His presence is testimony to his survival skills and adaptability. Water fills the dry riverbed often enough so that he can survive and he makes a living from the sparse flora in the desert.